✱ Put the cheeks in a large bowl or plastic container. Cut the vegetables to a rough mirepoix and scatter them over the beef with the garlic cloves and herbs. ✱ Heat the red wine and port in a heavy-based saucepan over a high heat. Bring to the boil, then lower the heat and simmer until reduced by half. Allow o cool a little then pour over the beef and vegetables. (Make sure the marinade is still warm, which helps all the flavours to penetrate the meat.) Leave to cool at room temperature, then cover and refrigerate. Leave to marinate for 24 hours. ✱ When ready to cook, preheat your oven to 110°C. Tip the beef and vegetables into a colander to drain, reserving the marinade. Set aside the vegetables and herbs. Lightly dust the beef cheeks with flour, patting to remove any excess. The flour is not used to thicken the sauce, but helps to prevent the cheeks from burning when you brown them. ✱ Heat the oil in a large casserole or braising pan over a moderate heat. Season the beef cheeks and add them to the pan. Fry one at a time, until browned evenly all over. Drain on kitchen paper. Add the reserved vegetables to the pan and fry until browned all over. Add the marinade to the pan and bring to the boil. Lower the heat and simmer until reduced by half. ✱ Meanwhile, bring the veal stock to a gentle simmer in another pan. Add the beef and reserved herbs to the braising pan then add the hot stock. Bring it all to a gentle simmer then skim, taste and adjust the seasoning to your taste. Cut a piece of greaseproof paper to the size of the pan to make a cartouche and place on the surface. Cover tightly with a lid and transfer to the oven. Braise for 4 hours, checking and turning every 30 minutes or so. At the end of the cooking time the beef cheeks should be soft and tender. ✱ Remove the beef cheeks from the pan and keep warm. Strain the braising liquor through a fine sieve then bring to the boil over a high heat. Cook until reduced to a syrupy sauce consistency. 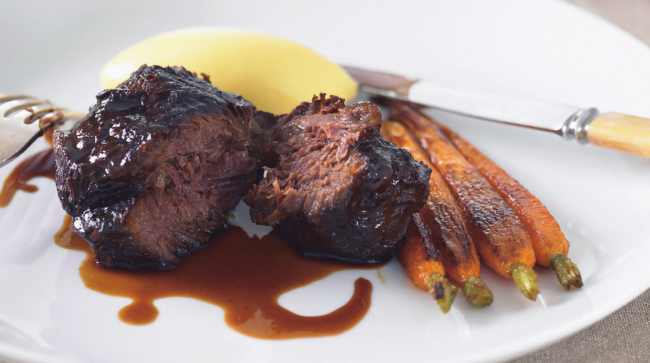 To serve, place a beef cheek on each plate and ladle over the hot sauce. Serve with your choice of accompaniments. ✱ If you don’t want to serve the beef immediately, allow it to cool then transfer everything to a container with a tight-fitting lid and refrigerate. The Daube will keep in a sealed container in the refrigerator for up to 5 days.